I’ve decided to call this section of Charleston Mobile Marketing’s website “Show & Tell” It’s our blog but play along for a minute. Can you remember what show and tell was like? What comes to mind and what kinds of images and feelings are brought back when you hear the words “Show & Tell“. You DO remember show & tell don’t you? I thought it was the best part of the week! In my classroom, every Friday I think, everyone in the class brought in one of their favorite things and they would stand up in front of the class and share it with everyone. They would show it, sometimes pass it around, tell us what it was and teach us all about it. It was great! I always loved show & tell. When you think about it, learning what others have to share about their favorite things, the things that they are the most passionate about, is probably the best way to learn about anything in the whole wide world and today, on the world wide web. I also believe that having the ability to share my own expertise on things that were important to me gave me my earliest sense of contributing to the world around me. Today, I think of Social Media websites as the biggest and best show & tell game the world has ever seen. Not many would argue that they don’t love being able to share on Facebook or Twitter. Except now, the game has changed a little bit and instead of sharing with a class of 25 students, you have the potential to share with the world and the best part of all of this is that it’s still great fun! I would even go so far as to say that it’s social proof that everyone enjoys a good game of show & tell. So WHAT does this have to do with you and Charleston Mobile Marketing? Well, mobile marketing isn’t much different than a good game of show and tell just like social media is. The difference, is that instead of waiting until Friday to show off to the world what you are excited about or, posting it to social media and waiting for someone to come and be excited about it too, you share that message with them right now. Practically right this instant as a matter of fact. That’s when I started thinking about the kinds of things I wanted to share with the readers of this website, I knew that I’d be sharing the latest mobile marketing news & knowledge of the industry by not only myself, but by others who are considered experts in the industry. 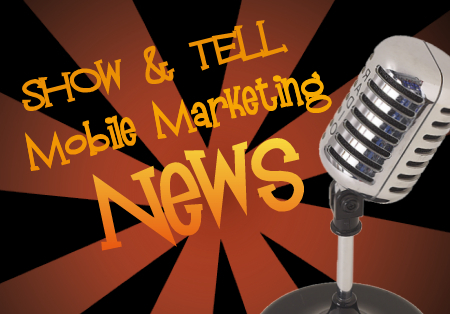 I want to show you what companies are doing in the mobile marketing industry and share with you what’s coming in the future. I want to offer you everything you need to know about mobile marketing in order to run successful mobile marketing campaigns for your business. So, this is how I’ve decided to do that for you. The show & tell section is where you will find everything I want to share with you about the new and exciting industry that I have become so passionate about and that I believe is the single best new technology for your business. I encourage you to play along in the game by making sure you comment on the posts and sharing with others your thoughts and experiences in what you’re doing for your business with mobile marketing. I look forward to seeing your favorite things here and hearing you tell me what it is and all about it. So be sure to check this section every time you visit the site or better yet, text show&tell to 72727 to get all of our updates and never miss a show & tell moment.